Jesse Chislett was born in October 1888, the son of general labourer John Chislett (b 1848) and glove sewer Mary Jane née Collins (b 1858). John and Mary had eight children; John Ernest (1881-1960), Arthur (b 1882), Ellen Elizabeth (b 1884), Jesse (1888-1918), Emmanuel (b 1890), Nathaniel (b 1892), William Henry (b 1894) and Eva Victoria (b 1898). In the 1891 census John and Mary were listed living at 35 New Prospect Place with their five eldest children, including 2-year old Jesse. All five of their sons would serve in the Great War. New Prospect Place, also known as 'The Colony', was a long terrace of small cottages, little better than slums and occupied by the very poorest families. The buildings were very tiny and, indeed, the dwellings in New Prospect Place were described as "simply huts with no foundations and originally having earth floors". To bring up eight children in such squalid conditions is difficult to imagine. By the time of the 1901 census the family had taken over the hut next door as well and were listed at 34 & 35 New Prospect Place. As well as John, Mary and their eight children, they also had living with them their 7-month old grandson Wreford - presumably the illegitimate son of either 20-year old Ernest or 19-year old Arthur. 13-year old Jesse was working as a farm labourer. On 16 March 1910, at the age of 21 years and 5 months, Jesse enlisted in the Territorial Force at which time he was working as a mason's labourer at JH Chapman & Co and still living at New Prospect Place. He joined the 5th Battalion, Somerset Light Infantry (Service No 1092). His enlistment paper is shown below. Jesse was still serving in the Territorials at the outbreak of war. He was transferred to the 2nd Battalion of the Worcestershire Regiment (Service No 49458) and sent to France on 8 February 1918. The 2nd Battalion was part of 100th Brigade in 33rd Division and in 1918 they were in action in the Battle of Lys. The Battle of Lys, also known as the Fourth Battle of Ypres, was part of the 1918 German Spring Offensive in a final attempt to break the Allied lines around Ypres. By the Spring of 1918, the Germans knew that they faced a major problem on the Western Front. Since the American declaration of war, American soldiers had arrived in Western Europe in very large numbers. The German High Command knew that these numbers would only dramatically increase given time. The Spring Offensive was an attempt to defeat the Allies before the full might of the Americans reached Western Europe. The aim of the Battle of Lys from the German point of view was to capture Ypres and the surrounding high ground around Messines. The German attack started on 9 April 1918 following a two-day artillery bombardment. Another German attack the following day led to the capture of what was left of the village of Messines. While the ruins of the village may not have accounted for much, the Germans greatly benefited by the height that the Messines Ridge gave to them. On 12 April the Germans made a concerted attempt to capture Hazebrouk, a major Allied logistics centre. The capture of this town would have been a major blow for the Allies. However, the town held out when the Australian 1st Division halted the German advance five miles from the town centre. The Battle of Lys cost the Germans dearly in terms of men lost. While the arrival of thousands of US troops boosted Allied manpower, the Germans could not afford such losses despite men arriving from the Eastern Front. The Germans lost 120,000 killed, wounded or missing. While the initial territorial gains in the battle may have boosted German confidence in their High Command, they could not cope with their overall losses. British and French losses were on a similar scale. However, the steady inflow of US troops meant that the Allies could cope with this loss. Jesse Chislett was killed in action during the Battle of Lys, on 12 April 1918. He was aged 30 and had only been in the front line for about two months. 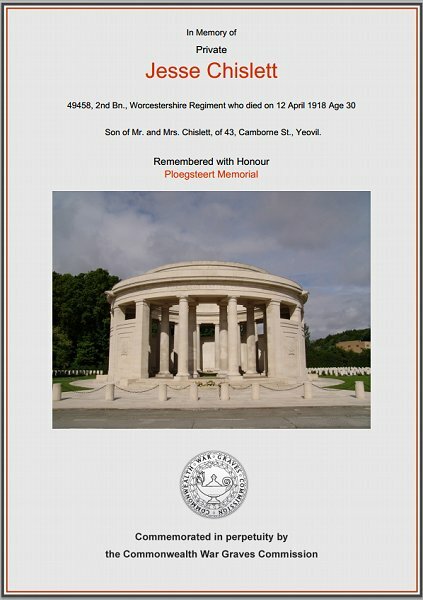 On 3 May 1918 the Western Gazette reported "Private J. Chislett, of the Worcester Regiment, whose parents reside at 1 Camborne Street, was killed in action in France earlier this month during the heavy fighting on the Western Front. At the outbreak of hostilities, Private Chislett was serving in the Territorials and at the time of his death he had been in HM service for about eight years. He was drafted to France on February 8th this year, and had only served in that theatre of war about two months when he was killed. The deceased has four other brothers serving in H.M. Forces, viz:- Private Wm H Chislett (RFA, France), Driver Emmanuel Chislett (Salonika), Privates Nathaniel (India) and A Chislett (who has been wounded four times in France)." Jesse's name is inscribed on Panel 5 of the Ploegsteert Memorial, Hainault, Belgium, and his name is recorded on the War Memorial in the Borough. 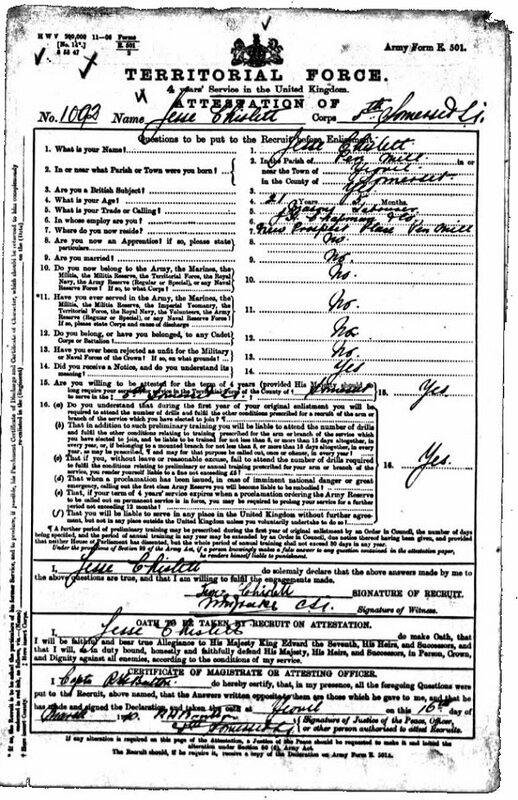 Jesse Chislett's enlistment papers for when he joined the Territorial Force in March 1910. The Commonwealth War Graves Commission certificate in memory of Jesse Chislett.